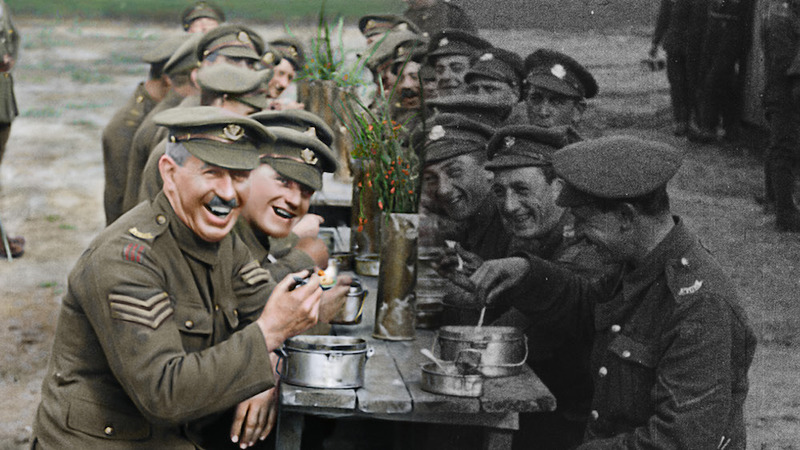 THEY SHALL NOT GROW OLD opens with a filmed introduction from its director, Oscar winner Peter Jackson (Lord of the Rings and The Hobbit trilogies) explaining the genesis of the Documentary we are about to see. He was approached by the Imperial War Museum to go through their vast archive (over 600 hours of clips and interviews) and make a movie honouring the British men and women that fought in World War I, plus make it accessible to a modern audience. Intrigued and inspired by the challenge and utilizing enhanced and digital technologies, as well as skillfully employing 3D, Jackson has fashioned a profound Documentary that educates, infuriates and emotionally invests those who only know about the “war to end all wars” from melodramatic Hollywood movies. Inspired in part by a vast amount of printed propaganda, British lads as young as 14 years old enlisted to fight a war they knew little about. Eschewing the more traditional “talking heads” route many documentaries follow, Jackson’s approach of using narration from interviews conducted in the 60s and 70s from the surviving soldiers makes everything we see on-screen more compelling and heartbreaking. Once THEY SHALL NOT GROW OLD transitions from black and white to colourized footage, the effect is mesmerizing. It is also difficult to watch at times. As we get to somewhat understand and empathize with these young men and what they went through, the brutality and ugliness of war rears its ugly head. There are grisly scenes of the aftermath of certain combats where fields are littered with dead soldiers. Only a strong stomach can watch rats or insects desecrate the dead. It is also harder to watch these scenes as they are real and not manufactured. More importantly, our grief is heightened as we also see the camaraderie between these young men and their sense of humour and dedication to the matters at hand. THEY SHALL NOT GROW OLD is a stunning accomplishment and surprisingly snubbed at this year’s Oscar nominations. Peter Jackson’s restoration processes are succinct and mind-blowing and I personally cannot wait when he uses these skills for his next documentary subject: taking 55 hours of never-released footage of The Beatles recording the classic Let It Be album.